We have adjusted our recipe to suit a home kitchen, readily available ingredients and equipment most home kitchens have. 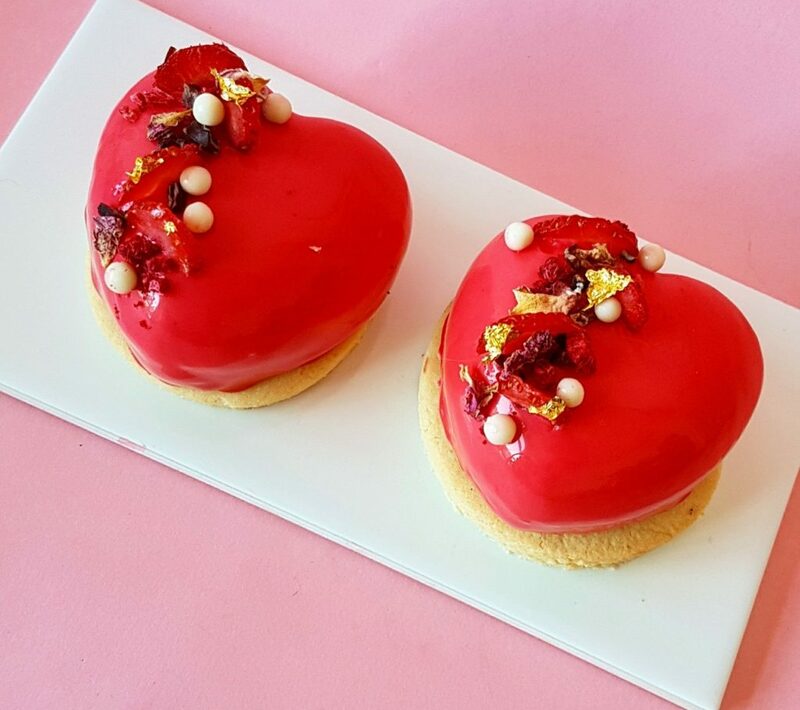 The recipe we are featuring is our valentines champagne strawberry mousse, developed for our Valentines menu this year. A basic entremet cake with a crisp buttery sable biscuit to balance the soft texture of the mousse. Sprinkle gelatin over the cold water and set aside. Bring milk, colour and glucose to the boil. Pour over the white chocolate, whisk in slowly (you don’t want to add air) or use an immersion blender keeping the blade below the surface the whole time. Put frozen mousses on a baking tray, pour glaze over. Using an offset spatula or sharp knife, slide blade under the mousse and carefully move to on top of the sable biscuit. We used champagne soaked strawberries, cacao nib, crisp pearls, roses and gold leaf to decorate ours. As individual serves they will take about 30 mins to defrost and be ready to eat. The ideal temperature for glazing is around 35-37 degrees (about blood temperature), and the mousse must be frozen. Any extra glaze can be stored in the freezer for up to a month. If you don’t want to try your hand at making your own entremet you can see our selection available in store (changes monthly) or order your own!